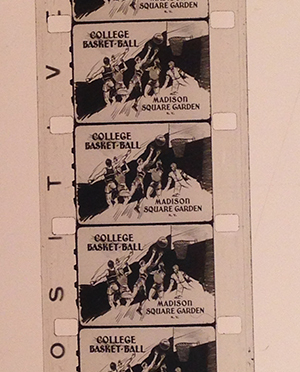 As you take the time to fill out your March Madness Bracket or look over President Obama’s 2015 picks for the NCAA Basketball Tournament, New York University Archives would like to share information about its own rich sports history. Within the University Archives exists a trove of documents, photographs, publications, artifacts, and architectural drawings detailing the history of the university and the individuals who have shaped it. 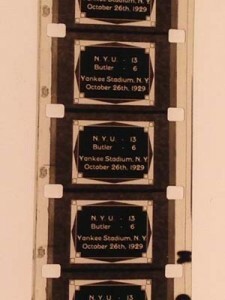 Among these riches exists a collection documenting the athletic history of NYU. 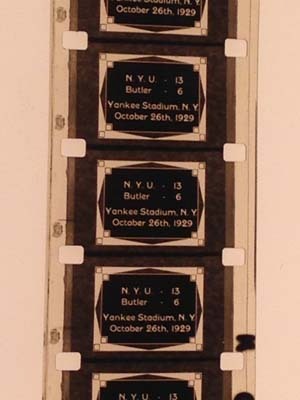 Intertitle from one of the oldest films in the collection, a 16mm reel of football games featuring NYU vs. Butler, and NYU vs. Penn State. Both games were played at Yankee Stadium in October 1929. This reel was recently digitized. This collection includes a series of films, ranging in date from 1929 to 1974, as well as paper records that span a wider range (from 1889 through the 1990s). The films feature game-day recordings captured principally for coaches and players to review as a form of self and group analysis, but also include edited games which seem to have been produced for a wider audience. 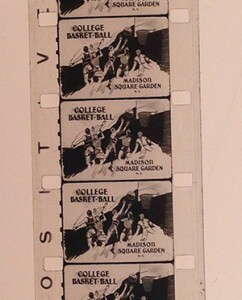 The films remained outside the custody of the Archives for decades and were transferred from the Division of Athletics to the Archives in the 1990s. Stay tuned for our next post, which will spotlight the Violets’ golden age of football and basketball. Here’s a sneak peek of a still from one of the football films.